Find yourself in a flying machine made of wood, wire and canvass as you soar with your squadron over the fields of France in the early part of the century. 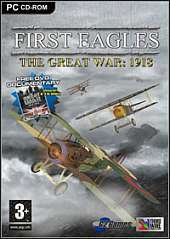 Set in the First World War, recreating the greatest air battles over France. Join the newly formed US Air Service, British Royal Air Force, French Military Aviation, or Imperial German Air Service and engage in desperate struggle to control the sky over the trenches. It has 3 campaigns featuring high-flying combat action over France set in the last four months of the war during the Allied counter-offensive to push the German army out of France. Random mission generator for maximum flexibility and replayability. Campaign missions are also randomly generated for different outcome each time. Fully scalable difficulty options to challenge both novice and expert pilots. Open architecture for future expansions and user-mod support. Download thousands of user-created skins, aircraft, terrain, missions, campaigns, and editors. Find yourself in any of the following player flyable machines - Fokker D.VII, Fokker D.VIIF, R.A.F. S.E.5a as well as the SPAD XIII C.1. AI pilots will take to the skies in Salmson 2 A.2, Albatros D.Va and the D.F.W. C.V.